From reservoirs and lagoons to municipal water ponds High Density Polyethylene (HDPE) is the most common field fabricated geomembrane material. The popularity of High Density Polyethylene (HDPE) is primarily due to its low initial material cost and excellent chemical resistance. 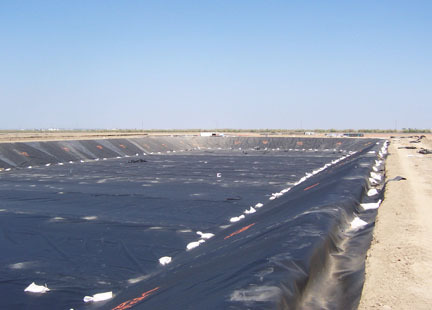 This allows thicker sections to be used compared to other geomembrane materials. A thick, durable, HDPE liner can be placed in exposed applications where the cost of other materials may be prohibitive. HDPE has excellent chemical resistance which is often the driving force behind the selection of HDPE. HDPE is a field assembled lining material that cannot be practically fabricated in the shop. All HDPE projects, regardless of size, must be installed by trained installers. HDPE is a versatile material which is used widely across all applications. One of the main uses of HDPE is for landfill base liners where its chemical resistance is used to good effect. HDPE can also be used in a multitude of secondary containments, pond linings, and water containment projects. HDPE is best used as an exposed lining material, and has the UV resistance required for many years of outstanding service.